CABLE HIGHLIGHTS: It was another big night for sports. Fox Sports 1’s NLCS game dominated Friday cable at 1.47, and ESPN’s NBA doubleheader was at 0.92/0.93. A&E’s LIVE PD gained 0.05 to 0.59. Discovery’s GOLD RUSH dropped 0.09 to 0.55, a follow-up special was at 0.34, and lead-in THE DIRT was down 0.06 to 0.23. On HGTV, MY LOTTERY DREAM HOUSE rose 0.04 to 0.34, HOUSE HUNTERS INTL climbed 0.05 to 0.26, and HOUSE HUNTERS was up 0.04 to 0.26. Food Network’s DINERS, DRIVE-INS & DIVES was at 0.29/0.28, compared to last week’s 0.26. On HBO, REAL TIME WITH BILL MAHER dipped 0.03 to 0.28, POD SAVE AMERICA ticked up to 0.12, and TRACY ULLMAN’S SHOW was down 0.04 to 0.03/212K. Adult Swim’s HARVEY BIRDMAN returned at 0.28. On ID, IN PLAIN SIGHT was at 0.23/0.21 compared to last week’s 0.23, and DEADLY WOMEN was at 0.22. Fox News’s THE INGRAHAM ANGLE led cable news at 0.22/0.38/2.5M, with CNN’s CUOMO PRIME TIME at 0.19/0.22/1.1M, and MSNBC’s RACHEL MADDOW SHOW at 0.17/0.24/1.9M. 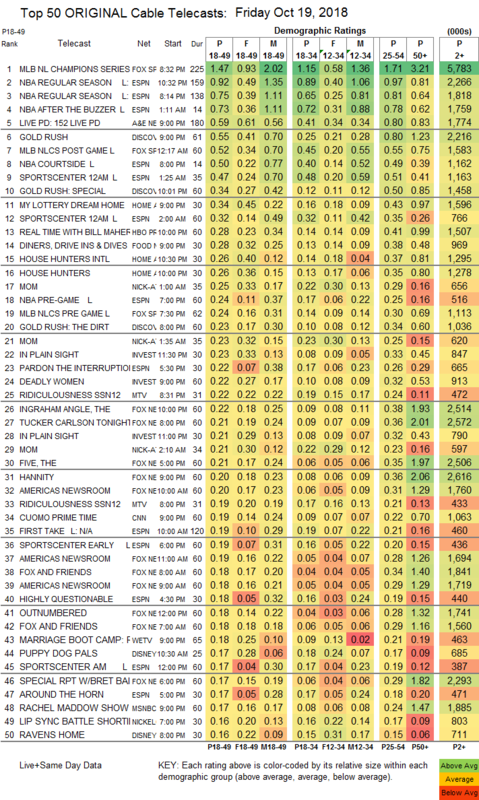 MTV’s RIDICULOUSNESS was at 0.22/0.19, compared to last week’s 0.24/0.21. We’s MARRIAGE BOOT CAMP grew by 0.05 to 0.18. 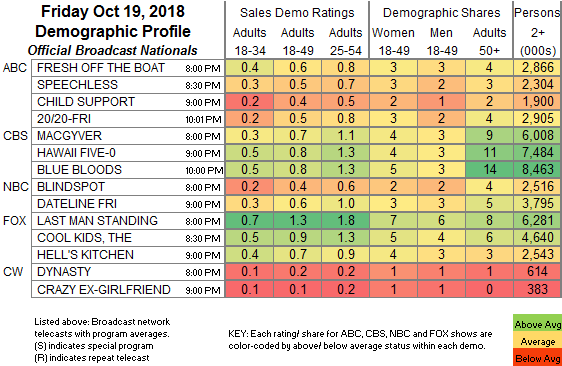 On Syfy, Z NATION fell 0.04 to 0.10, and VAN HELSING was down 0.04 to 0.09.